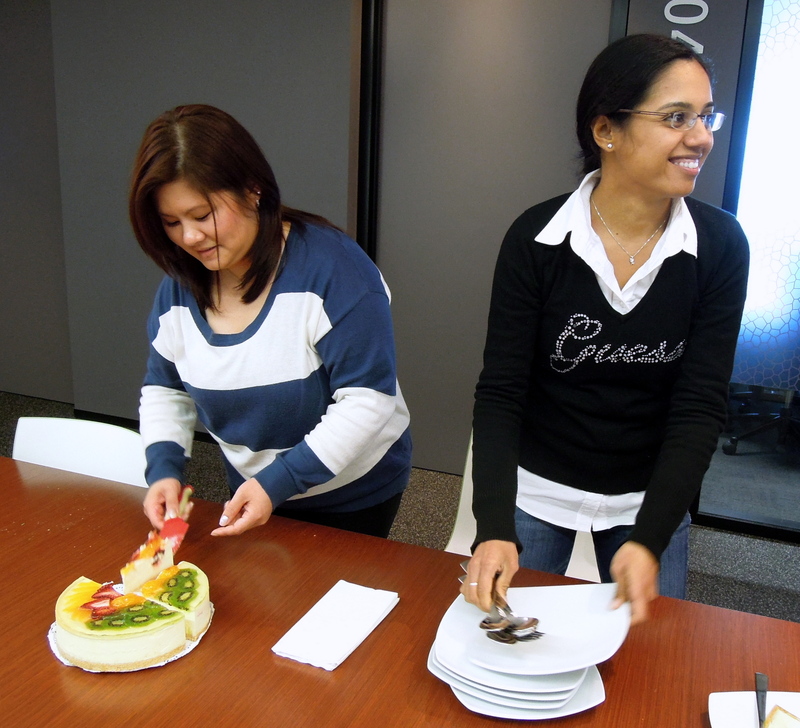 Phung’s birthday fell on Saturday, 24 August, so on Friday we celebrated it by sharing a cheesecake from Corica. 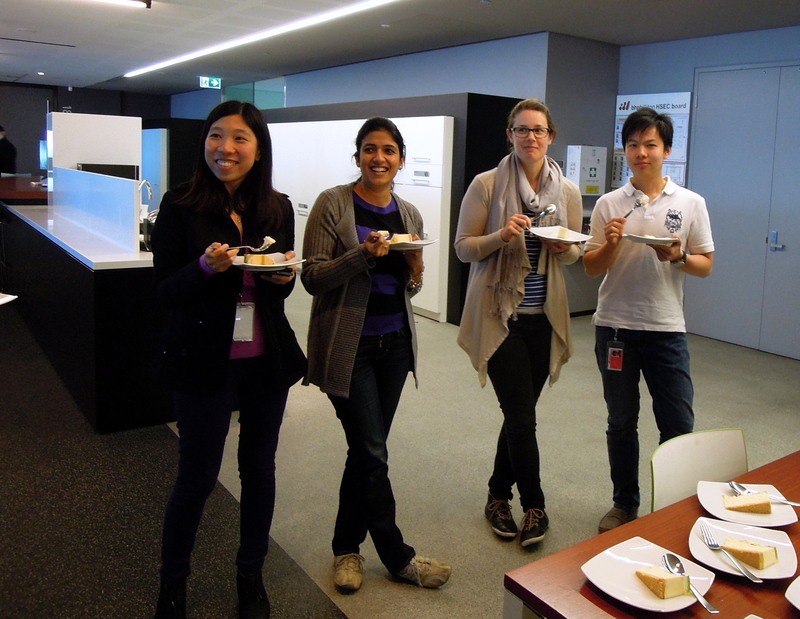 Birthdays are perfect excuses to take a break from work and have cake, though who needs any? Same project, new team. It’s taking me a while to get used to these people; we don’t seem to have much in common other than work. I suppose that’s why we have team lunches and gatherings. At least we agree Cheeky Sparrow makes good pizzas, that’s a start! I just received an invite for a quick drink after work today to celebrate the birthday of someone at work. It’s starting at 4:30 PM. The company has a strict no-alcohol policy in the office, so there is definitely no coming back after. Starting last week, I’m assuming a new role and joining a different team at work. It’s exciting, but at the same time scary and nerve-wracking. The new role requires me to get to the office earlier (Drats!) and in the first few days I couldn’t help but felt sleepy throughout the afternoon. During my recent haircut (it was just to introduce more layers and make my thick hair a little more manageable), I read an old magazine from the start of the year which provided astrological prediction of how the year would turn out for each of the zodiac signs. Mine actually read, “You will be offered a new role in September. If you take it, it will require a complete commitment and 2-3 years to fully master it. It will then present you with a lot of new career opportunities.” I don’t believe in astrological prediction, of course, but this is creepily right down to the month! I sure hope I am smarter than most Aquarians and get up to speed faster than in 2-3 years though. A month or two, perhaps? By now, after four years of working as a consultant, you can say I am familiar with people’s skepticism of my capability. A consultant is always treated as an outsider at first, someone who, without practical knowledge on a field, attempts to educate those more experienced, to whom the field is daily bread and butter. That aside, it is wrong to assume I am used to that, based on what I’m really feeling these days. My opinions in meetings do not (Optimists would say not yet) carry the same weight as others’ and that’s apparent, at least to me, from the responses I get. I suppose it’s fair that when engaging someone new, most people regard the person as having zero point in terms of integrity, capability level, trustworthiness, only to reward them when those attributes are proven. In the ideal world, people would regard one another as perfect until proven otherwise. Some people acknowledge this and move on. Not me. I overthink and overanalyse almost everything, feel bad about every single thing I say or do which may be perceived negatively, and invent cataclysmic outcome in my brain. Not unlike a religious person fussing over God’s commandments and the possibility of ending up in hell when they may not even be real. 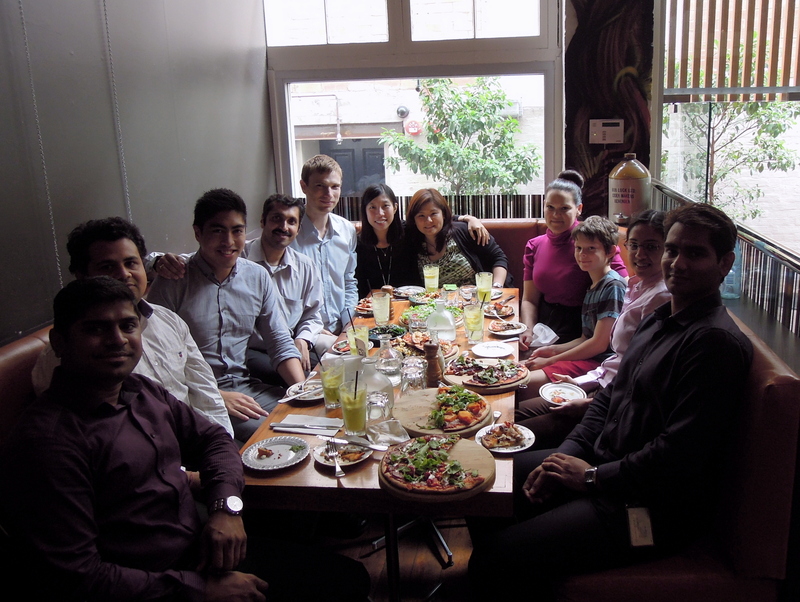 My team at work goes out for sponsored dinner once in a while. 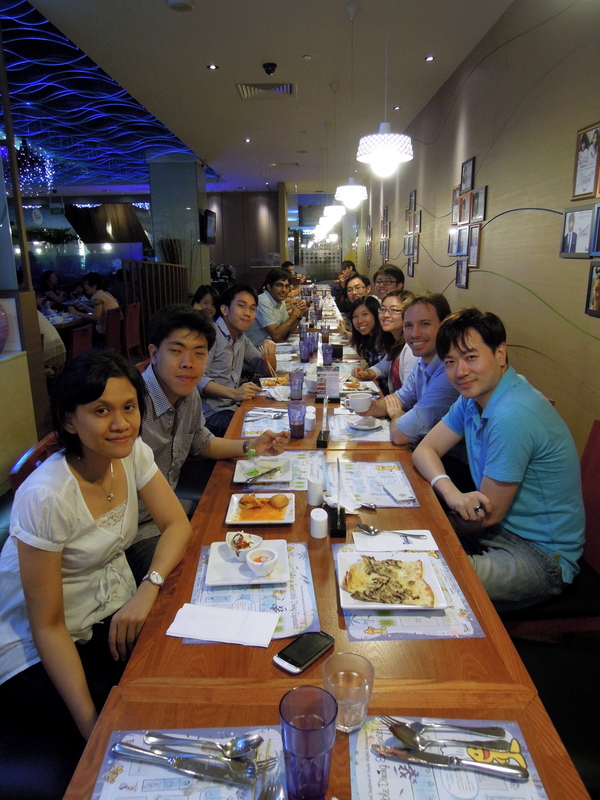 On Friday, we went to TODAI, a (mostly) Korean buffet restaurant serving a wide variety of international cuisine. It was a good way to unwind and interact with one another in a relaxed setting. 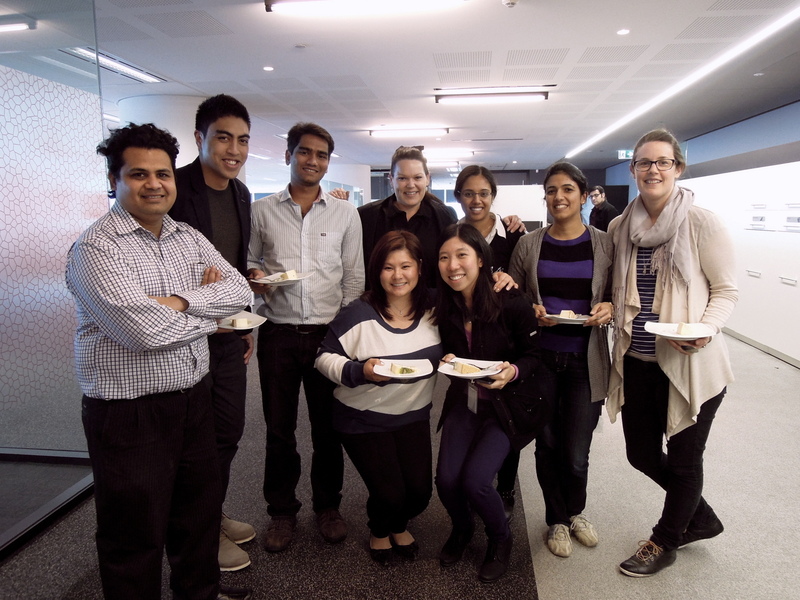 Plus, we Asians (with the exception of Frank who’s German) rarely turn down free meals. I tend to dress conservatively for work. By that, I didn’t mean I look like a nun, but I love dresses with classic silhouettes. I do not own that many good work dresses, though I would like to change that since they are so easy to throw on and contribute to less time mixing and matching in the morning. Here I’m showing you two of them which I am quite fond of. The first one is an online purchase from Flaunt. It’s too short for work, admittedly (When I saw the hem on the model, I thought it would be a good length for me since I assumed I was a lot shorter), but black stockings help to make it more appropriate. I also love the clean black lines on off-white. 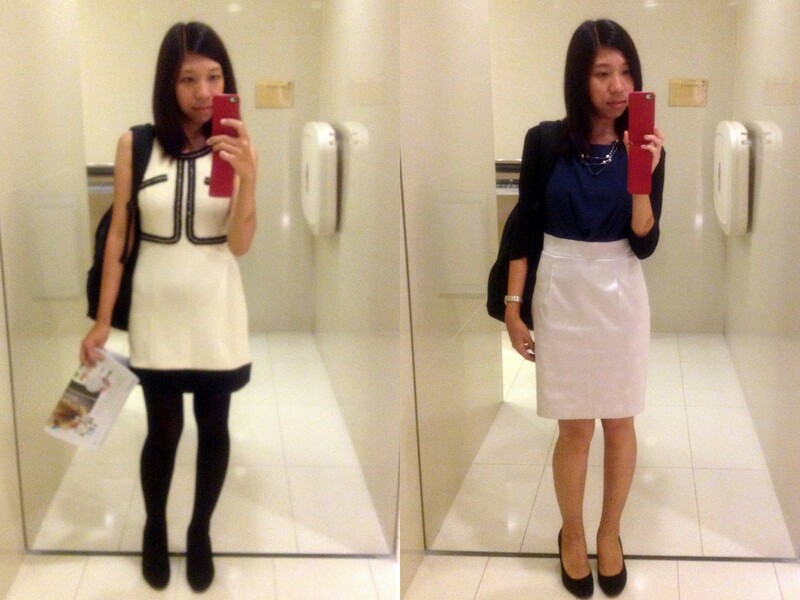 I like how the second dress looks like two separates, a blouse tucked into a pencil skirt. This dress fits me so well, I was so glad I spotted it when I was walking along the basement of Wisma Atria. I couldn’t even remember the brand, it was that unknown. It is sleeveless, but here I add a soft black cardigan and a shimmery necklace for a more put together look. In both instances, I wear my new pair of suede leather pumps from Witchery. Once you’re comfortable with a style, it’s easy to gravitate to the same pieces again and again. The problem with that is you then stop exploring new trends and may miss out on great styles which will look good on you and enhance your taste. I try to keep an open mind, read magazines and fashion blogs for inspiration, and not to be too afraid to try new things. Fashion, after all, should be fun and confidence-boosting. So I’m on the lookout for more interesting, colourful, well-made dresses which wouldn’t look out of place in a corporate environment. Any recommendation? Do you watch Ted talks? Recently Luis sent me a link to a particular one which truly put me in awe. Can you imagine working on a cause this powerful? I would be absolutely content.